Apple TV may get a Nintendo Wii-like remote control according to two identical patent applications published yesterday. 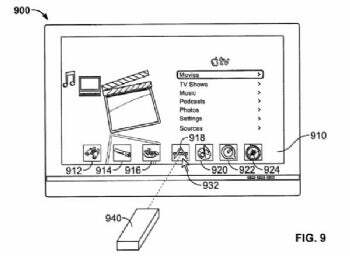 Referred to as a "wand," in the patent application, the invention described suggests Apple may look to expand Apple TV's capabilities into a full-fledged entertainment system. Apple proposes a variety of uses for the wand including "zoom operations, a keyboard application, an image application, an illustration application, and a media application." The patents were originally uncovered by Apple Insider. At its most basic level the wand could be used to call up a dock, and then to select an option from the menu by moving the wand across the screen. The controller could also scroll through a CoverFlow display and be used to manipulate photos by zooming in and out and rotating. Other operations include using the wand as a digital pen and operating Apple TV's on-screen keyboard. Apple has often called Apple TV a "hobby," despite its modest popularity. Acting CEO Tim Cook recently said Apple "will continue to invest [in Apple TV] because we fundamentally believe there is something there for us in the future." But if the wand patent is truly a sign that Apple wants its set-top box to become a complete entertainment console, then doesn't it need to embrace gaming? Sony's PlayStation 3 and Microsoft's Xbox 360 are battling it out for living room supremacy by embracing movie and television program downloads. Microsoft has also signed up for Netflix streaming capabilities. Since Microsoft and Sony are encroaching on the core business of iTunes and Apple TV, wouldn't it behoove Apple to consider returning the favor? Apple's patent filing for the wand does refer to a video game console once, but only as a cover-your-bases, just-in-case attitude that many patent filings have. That suggests Apple is not ruling anything out, but I doubt the company would consider gaming too seriously. The other problem is that Apple has never been one for game development and may already be too far behind in this area to catch up. However, as content streaming and download offerings expand, Apple TV may never truly be able to compete with consoles that play games, view movies and photos, play DVDs and Blu Ray discs, and access the Internet. At the moment, Apple TV can only do a small portion of these things. There's also the issue of whether the Apple wand infringes on any of Nintendo's patents for the Wiimote. Apple recently claimed it was going to be aggressive about protecting its own patents, and I would expect Nintendo to feel the same way. It's too early to say what will happen at this point, as the patent filing only points to a concept. It's entirely possible that Apple may decide the wand doesn't do what they want for the Apple TV or it could end up with an entirely different device. The wand patent does indicate, however, that Apple is thinking about Apple TV's future. The only question is: What will that future be? This story, "Patent Reveals Apple TV to Get a Wii-Like Remote" was originally published by PCWorld.